Hey guys! So I decided to pos gift guides for all different people this week. I’ll try to post one every day this week! So today is the Color Lover Gift Guide! I would definitely like ALL of these (hint hint) and I have a feeling everyone will like them. $10.00: Ban.do hair elastics. I am obsessed with all things ban.do. They’re so awesome and fun and colorful!! I actually have a planner from them and it’s great. $7.99: Colorful Bath Bombs. This one is really cool! Lush is great for them, too. I think anyone would enjoy a bath bomb😉. $26.00: Rainbow Umbrella. I have a thing for colorful umbrellas! This one is really pretty. 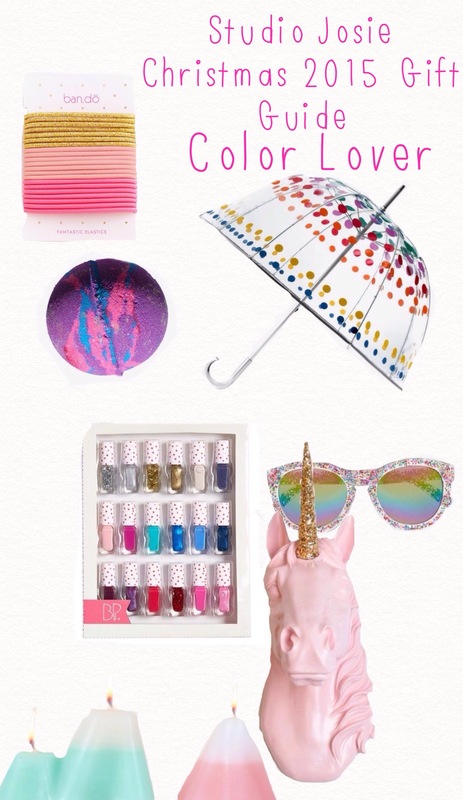 $20.00: Rainbow Nail Polish Set. I rarely paint my nails, but if I had this set I wouldn’t go a day without polish! $20.00: Rainbow Sunglasses. These are a bit cray-cray, but I think they’re also pretty awesome. Haha just noticed the last 3 things in a row were rainbow! Lol. $10.00: Pastel Mountain Candles. These are sooooo cute and a great gift! $99.99: Pink Glitter Unicorn Taxidermey. Despite the… unfortunate…price, this is pretty awesome!! Hope you guys enjoyed this!!! Stay tuned this week for more Studio Josie Gift Guides! Have a great day! Previous Previous post: Christmas Doodling! Next Next post: Gingerbread House Decorating!